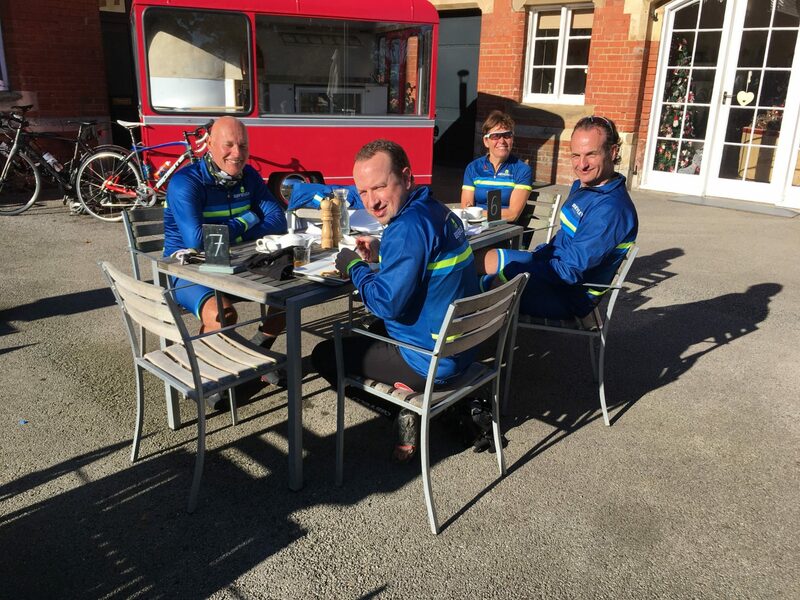 The “season of mists and mellow fruitfulness” continue to provide us with superb cycling weather and inspired ten knights to make the most of it and bask in the morning sunshine as we gathered around the Market Cross. Having recently returned from foreign travels celebrating his retirement, Mike put in his first appearance for some months. Summer bikes were still on show and even some daring to stick with shorts. Our route saw us heading out of Beverley through North Bar and Molescroft Road with James setting the initial pace. Passing the Molescroft Inn, there was a distinct whiff of “fish & chips” wafting across the road. Not quite what you’d expect for breakfast! Heather then found herself at the front and led the group up to the Dog Kennel roundabout before Pugwash set the pace into Cherry Burton. Passing through Etton we came upon a lone horse rider leading a second horse. While the first half of our group managed to pass, the remainder held back due to the skittish behaviour of the ‘led’ horse. When it was safe to pass the rider passed comment about “calling out” when approaching from behind. The knights regrouped at South Dalton where we took the Mere road leading onto Bracken. With a helpful wind we soon arrived at Cranswick. 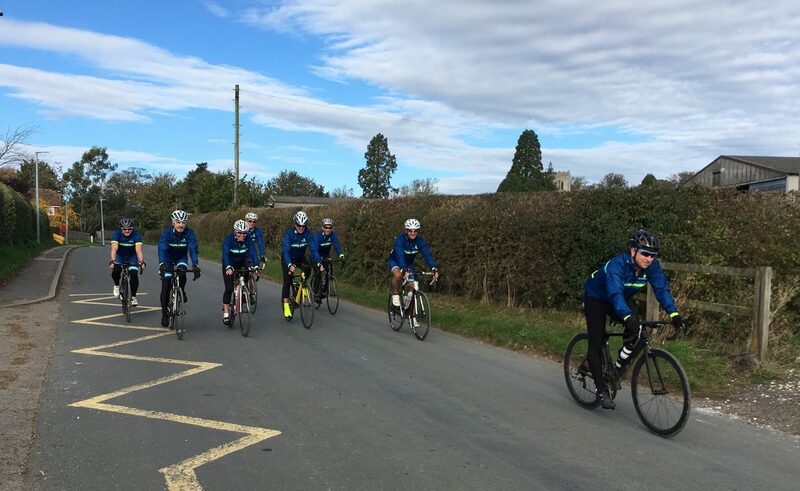 The pace picked up again as we headed for Skerne where James left the group to return home for an “early bath” while the remainder headed to Wansford. A bit more caution was required due to the road surface as we made our way along Carr Lane to the rail crossing at Outgates. It was interesting watching the many different ways of manoeuvring our bikes over/around the gates. 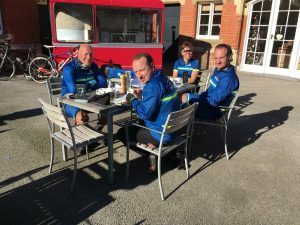 It was around this time that Mike showed his lack of match fitness with “Are we nearly there yet?” Fortunately for him we were nearing Harpham so not long to wait for our coffee break. Unfortunately for him, he suffered a visit from the puncture fairy when approaching the final strait. Expensive snack stop at Burton Agnes. A café that doesn’t cook eggs? 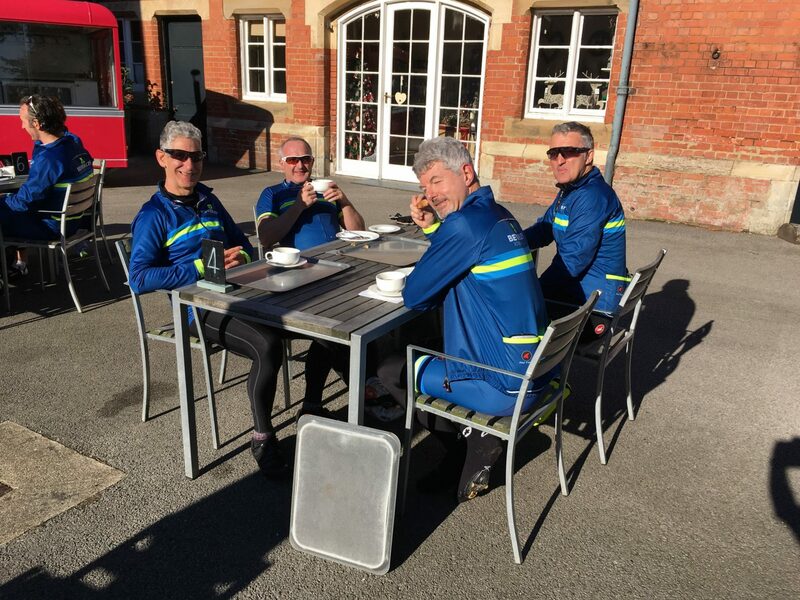 The café at Burton Agnes was relatively quiet when we arrived and with the sun providing enough warmth we opted to sit outside. The earlier calls for “credit cards at the ready” were a little exaggerated. While the cost was higher compared with other cafes we attend, we did get crisps and salad along with the bacon buttie! Not sure that justifies the extra £2. Before setting off, we consulted Neil’s map to check the best return route. No matter which way round we looked at the map there was no way to avoid the head winds on the way back. Leaving Burton Agnes a few pounds(£) lighter all in team kit. We set out towards Gransmoor, Great Kelk and Foston-on-the-Wolds. With regular changes of personnel on the front the pace remained high until reaching North Frodingham. 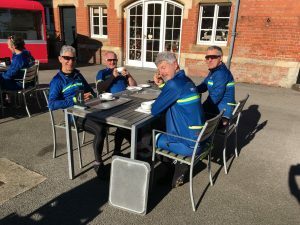 A little additional assistance was given to Mike with Steve G giving verbal encouragement and a little shove from behind as we made our way to Brandesburton and back towards Tickton. How many more great rides can we have before the winter starts to bite. Looking forward to our next Sunday’s Spooktacular ride, weather permitting.